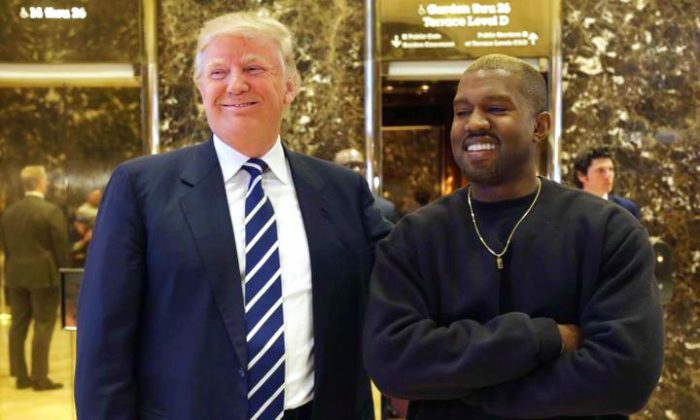 Rapper Kanye West was spotted at the Trump Tower on Tuesday morning. West, seen wearing a gold chain and sporting blonde hair, was photographed and filmed walking through the lobby of Trump’s Manhattan building before he could be seen getting on an elevator. It’s unclear what West and Trump will discuss. TMZ reported that West requested the meeting, and Trump agreed to it. It’s unclear if he was meeting Trump or someone else who works or lives in the building. The 39-year-old rapper’s entourage was also seen in the Trump Tower. There was speculation that West could perform at Trump’s Inauguration Day on Jan. 20, 2017. West was hospitalized for more than a week in Los Angeles and canceled the remainder of his Saint Pablo Tour. Reports said that he was suffering from exhaustion, prompting his hospitalization. In his final two concerts, he expressed praise for Trump and also lashed out at Jay Z and Beyonce. “If I would’ve voted, I would’ve voted Trump,” he told a crowd in a San Jose, California, concert.